One Hour Super Class & Social May 24th! 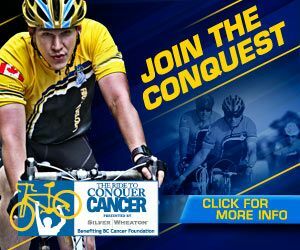 Our trainers Sean, Paul and Devin have committed to the 2 day bike ride to Seattle and back this June. That’s over 400km! But to do it, they need your help to raise the funds and register. All proceeds will go to support the BC Cancer Foundation, so bust out your wallets and give generously. Okay, so how can I help? Glad you asked. There are 3 ways to support the guys. Test your toughness with our Tough Mudder trainees during our 1 hour Saturday Super Class. This will be a fun class for all levels with intense interval training and multiple stations designed by Sean, Paul and Devin. After the Super Class we’ll be having a burger n’ beer (or veggie, salmon, chicken burger n’ beer) at the Pint just across the street. 3. Buy 50/50 Tickets WINNER IS #5494085 Please collect your cash at the front desk before May 31st. *You do NOT have to be present at the draw to win. We will post the winning ticket number on social media and our website the following week until June 1st to be claimed. p.s.-Check out what the pot is at on the whiteboard in the gym downstairs. Hope to see you May 24th! From everyone at KFS, thanks for your support.